Anders Wright reports on the upcoming showing of "Old Money," a short film by Jay Drose, on the 4K projector in the Calit2 Auditorium. The 4K "projects at a resolution that?s considerably better than the standard 2K projectors that go into most new cineplexes." Spanish-language interview by Carolina del Olmo with UCSD visual arts professor and 'art-activist' Ricardo Dominguez, a principal investigator in Calit2 and co-founder of the *particle group* of new-media artists. Review of new book on San Diego architecture by Dirk Sutro praises the award-winning Atkinson Hall at UC San Diego, home to the California Institute for Telecommunications and Information Technology (Calit2). Article by Bruce Bigelow of Xconomy.com about the Xconomy Forum on smart energy, which was held at Calit2's Atkinson Hall and featured Calit2 Director Larry Smarr as the keynote speaker. Signs of life in the biotech exit market? Brandon Glenn notes that Calit2's Larry Smarr is "an early adopter of the lifestyle known as the quantified self," pointing to Smarr's talk at a forum in Seattle recently for Xconomy.com. How Internet Pioneer Larry Smarr Lost 20 Pounds by Becoming a ?Quantified Self? Luke Timmerman reports on Calit2 director Larry Smarr's presentation to the OVP Tech Summit in Seattle, where he focused on how he is living proof of a coming trend: using information technology to regularly monitor one's wellness. The online news network SDNN republishes an article from Xconomy about Calit2 director Larry Smarr's wellness solution: quantifying data about what goes on in the individual body, using IT and wireless tools. The online news site notes its upcoming Xconomy Forum on smart energy, hosted by Calit2 at UCSD with keynote speaker Larry Smarr. The magazine picked up the announcement of Calit2's new Chip-Scale Photonic Testing Facility in Atkinson Hall, with support from Agilent and NSF. Pickup of Calit2 news release re: creation of a new lab at Calit2 for chip-scale photonics. The online investor news source re-printed the UCSD news release about a new lab at Calit2 for chip-scale testing of photonics devices. A new silicon revolution that merges silicon chips with sophisticated wireless tools in the millimeter and microwave range is evident based on the accepted papers from UCSD at IMS 2010 and RFIC 2010. UCSD and Calit2 electrical engineers have more papers than any other university at the co-located conferences. UCSD professor Ricardo Dominguez is quoted in this article by Dan Goodin in San Francisco, focusing on the issue of civil disobedience in the digital age. In the Wired Campus section, Josh Keller reports on the new UC San Diego Energy Dashboard and interviewed its principal developer, Yuvraj Agarwal. One of the greenest campuses in the country is showcasing sustainability in art, with a new exhibition called "A Light Green Light", opening April 2 in the gallery@calit2. Editor Barbara Bry reports on the launch of a new Internet portal offering real-time measurement and visualization of energy use on the UCSD campus, including for Atkinson Hall and the CSE building. A preview of upcoming events this week during the San Diego Science Festival, organized by UCSD, include a two-hour event with magician Jamy Ian Swiss, to take place in the Calit2 Auditorium on Wednesday, March 24 from 6pm to 8pm. The website notes that Calit2's Larry Smarr will be among the speakers at a May 2-3 conference organized by the Seattle chapter of the National Academy of Engineering. The report is picked up from HealthDay News, about the research of UCSD professor James Fowler, who is affiliated with Calit2's Center for Wireless and Population Health Systems. In the publition's Wired Campus section, Josh Fischman reports on Calit2 and Larry Smarr's efforts to associate ocean microbe DNA with environmental metadata. An article by AnneMaria Stephens highlights the work of Calit2's Maurizio Seracini and other UCSD-based, arts-oriented faculty and students. Jean Lowerison writes about the new play directed by Calit2's own new Director in Residence, featuring UCSD actors. Theater critic James Hebert reports on the staging of a play by Calit2's new Director in Residence. "Ashley is also partnering on the "Revenger's Tragedy" with Calit2, the UCSD hive mind of outrageously creative tech-tonics," writes Hebert. "The director has talked for some time about organizing a citywide festival of art and technology, and Calit2 likely would be a major player in that." The paper's theater critic notes that Calit2's director in residence directs the new production at Potiker Theatre. The online news service picks up Calit2's news release about the CYCORE joint venture with Texas's M.D. Anderson School of Medicine to create a cyberinfrastructure that will improve the study of comparative effectiveness of cancer treatments. An even-handed report on the development of the Transborder Immigrant Tool, quoting the project's leader, visual art professor Ricardo Dominguez. Calit2 researchers in the CYCORE project will develop cyberinfrastructure to improve data on comparative effectivess of cancer treatments. Gregory Huang reports on the inaugural Google Focused Research Awards, including one to a team led by Tajana Rosing of ECE/Calit2. In a sidebar to an article about a possible newly-found painting by Leonardo da Vinci, the public radio station in Boston highlights its prior audio feature about Calit2's Maurizio Seracini. PhysOrg, one of the leading web-based science, technology and research news services, picks up our story on a Calit2 research project that is using ways to use radio frequency identification tags to track first responders inside buildings. The high-performance computing news service carries a first-person article by Calit2 director Larry Smarr, reflecting on the NSF Supercomputer Center program, past, present and future. CDRInfo, a source of information about CD, DVD and other related optical media technologies, covers Calit2's new HUVR virtual reality device. Science columnist Lynne Friedmann reports on UCSD Health Sciences and its Clinical and Translational Research Institute (CTRI), which will draw upon computing resources at Calit2 to develop a "common infrastructure that emphasizes 'group science' through shared research and resources and institutional support." 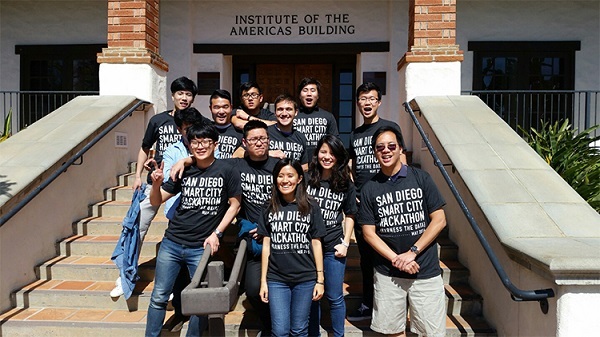 Red Orbit reports on the world record broken by UCSD computer scientists, who sorted one trillion data records in 172 minutes ? and did so using just a quarter of the computing resources of the other record holder. VizWorld's Randall Hand reports on the Calit2 NexCAVE, which he calls "an impressive new visualization system." The Union-Tribune's James Chute reports on the 2010 California Biennial, which, for the first time, is heavy on work by San Diego artists and features installations by Calit2 visual artists Ricardo Dominguez and Nina Waisman. 10 News carries a story on FireSense, a new collaboration between Calit2, CalFire and the San Diego County Board of Supervisors that is designed to tackle wildfires early. RedOrbit, an online community for those with an interest in science, space, health and technology, reports on the 'citizen scientists' who are helping Calit2-based explorer Albert Yu-Min Lin look for Bronze Age burial sites and other antiquities in Mongolia. Brad Graves of the SDBJ quotes Calit2-UCSD director Ramash Rao about the exciting potential of fourth generation wireless telecom networks. San Diego 6 reports on a Calit2 partnership that has embedded 50 live webcams in San Diego County's backcountry as part of a new program designed to tackle wildfires early. Vodule, which describes its mission as "tracing the extension of volume and modularity in 3-D, augmented reality, and emerging media," features a story on Calit2's current exhibition, "Mapping Time."